Henry Payne is the editorial cartoonist for The Detroit News. His work is syndicated to an additional 60 newspapers nationwide via United Feature Syndicate. Payne has been a runner-up for the Pulitzer Prize. 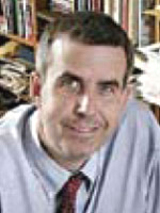 Payne is a writer as well as an artist, and his articles have appeared in The Wall Street Journal, The Weekly Standard magazine, National Review and Reason magazine.